It's that time of year again: The Rockettes are setting up shop at Radio City. This year's preceding off-season included a touch of drama when former director Linda Haberman left after her spring show Heart and Lights was postponed. Former Rockette Julie Branam stepped in to fill the gap. Branam joins us to talk about this year's Christmas Spectacular. Julie Branam was a bunhead before she became a Rockette: That was 27 years ago. Christmas, as you may imagine, has been more about work than a holiday, but it’s a testament to her cheerfulness that she doesn’t hate it. “The Nutcracker is the only music that’s not allowed to be played in my house,” she says at Radio City Music Hall before a long day of “animal orientation” for the nativity scene and dress rehearsals for two casts. This season, Branam, who previously ran the touring productions, takes over as director and choreographer of the Radio City Christmas Spectacular. It’s so funny. I am from Iowa, and I was in a ballet company that disbanded because of a lack of funds—like there is so often. Jorge Samaniego. He’s since passed away. We packed up a U-Haul and drove from Iowa to here. But the first time I came here to just study for a summer, the first place we came to was Radio City Music Hall, which was so crazy. I was always a ballet person, so I never thought I would put tap shoes on and do all of that. My first night in New York was here, and I’m still here. I kind of auditioned on a whim, really. I was like, "I’m the right height." And I was so happy because at that point the Rockettes did tour jetés at the audition, and I had a good tour jeté back in the day. It was really fun to do. The first time I auditioned was for a Disney summer show, and I did not get the job. They wanted me to come in as a dancer, because I did pointe work, and I couldn’t. I was working as a model. Then I came back; they called me in because they were adding swings to the show. The roster went up to 48, and I got hired as a swing and had to learn all 36 parts. It was new terminology, and in those days they didn’t even say stage left and stage right; they said prompt and O.P. or opposite prompt. I had never heard those terms ever. Most of the women had done the show for years, so it was only a two-week rehearsal period and we were in. The first time I was on the stage was in front of 6,000 people. It was the fourth and fifth show of the day. I remember it so vividly because I had to wait three shows before I got to go on. I danced in the wings, I made all the costume changes, I just pretended I was in it. How did it compare to the rigor of ballet? It was different. Now the Rockettes are so well versed in all forms of dance and I just think no matter what kind of dancing you do, if you have a ballet foundation, you are good to go. I think that’s why I’ve continued to dance, and I can kick eye-high. I think it’s such an important start for anybody, no matter what your expertise may be, and all the choreography today supports that. The ballet company was certainly different because we didn’t have a six-hour day; we sometimes had a longer day, I would prefer wearing a heel to pointe shoes. [Laughs] My feet didn’t get as bloody. I wasn’t a big tapper when I started here, and that’s certainly still not my strong suit, but I kind of learned by doing. When you were a Rockette, who was in charge? Violet Holmes was the director. She was very soft-spoken. She was a Rockette for a long time, beginning in 1945 until she retired. I don’t think she directed a show, but she choreographed a lot of our numbers and there were other choreographers that would come in also. She was very kind. She was a real hoofer. She didn’t always say all the names of steps; she would sing the steps: “Badoodlee doodley deedely dee.” You would hear the rhythms, which for me not having a huge tap background was actually helpful; that’s how I learned things. I didn’t always know the names of steps when I started. How did you progress to dance captain and assistant choreographer? It all kind of happened at once. When the show went out on the road—when they took it CAA—Christmas Across America—to Branson, they did a promo. It’s funny: I was about to get married, and they said, “Do you know ‘Sticks with Kicks,’ and could you go to Branson and be dance captain?” We were just going to the justice of the peace; it wasn’t like it was going to be some big wedding, so I went to Branson. They realized that I could talk and do these other things and that’s how it came about, so I did the whole promotional tour to radio stations through Branson and Springfield, went home to see my parents in Iowa, came back, got married and then I got the call. I think because I was a swing, I knew all the ins and outs. I knew “Wooden Soldiers,” so for the people putting that show together, I was a benefit. I knew some of the traditional things that were done here, and some of the Rockettes thought I was crazy to go out on the road on a less prestigious tour—it was a line of 18, not 36. Financially, it wasn’t beneficial, but I did it because my parents had never seen me dance as a Rockette. My dad’s a quadriplegic in a wheelchair and they live in Iowa. Yes. Since he was 27. Diving. He’s been in a wheelchair for most of my life, so they could drive to Branson and see me. That was one of my biggest draws, and I also thought it was an amazing opportunity to learn some new things: to teach, to be dance captain. So when we started the audition tour, I thought I was going to be captain of the Rockettes and then they realized I had all this ballet training and could do other things. They made me captain of the whole show. That’s how it evolved. I think, Boy, if I had said no to Branson, I don’t know what I’d be doing. It’s really crazy how things stick out. What is “Sticks with Kicks”? Are there older numbers that you’d love to bring back? I would love to see us continue to move forward. First of all, I’m probably the Rockettes’ biggest fan. I love them so much and their dedication. You know—being a dancer, you try your whole life to stand out, and to have the discipline to actually dance like everybody else takes a lot of effort. I would love for us to do contemporary things; they’re all important. The tradition of the Rockettes and the sisterhood that evolves—I have friends that I danced with, and we will remain friends forever. I’m a big believer in a line that dances together and gets along together and has fun together is a better line. We have a better end product all around when people are happier and dancing at their best and supporting one another. It makes things that much more special. You’ve been working on the road for all this time, right? This is the first time I’ve been here. Yesterday was my birthday. I have a 17-year-old son, and it’s the first time he’s said “happy birthday” to me in person since he was born. And it was the orchestra’s first day, and they played “Happy Birthday.” It was truly an amazing morning. Have you been choreographing your own numbers on the road? I’ve been basically keeping things in shape. I’ve worked on all the numbers from the get-go that we’ve done thus far anyway, so I’ve always been in from the beginning. There are publicity things that come up that I will choreograph. Linda Haberman had the job on the road before you, correct? Yes. She’s the one I assisted in CAA, and then she took over New York, and I started directing the show out on the road in 1998. When I first started I was a swing and dance captain of the show, and then we had more shows on the road and I was fortunate enough to be asked to direct one. How close were you with Linda? We worked together for 20 years. I look up to her, and I can’t believe the amazing things she’s done for the Rockettes. It’s been a wonderful trip for sure. How did you hear about this position? Did they contact you? Mm hmm. I actually started working here in January full-time. I thought I was going to do what I’ve been doing, which is running the Rockettes Summer Intensive. This is my second year of doing that: trying to get us back to the foundation of starting a warm-up with a ballet barre; doing some ballet to try to get these kids to not just do tricks, but have a foundation on which to build some better dancing. I was planning to do that, a lot of the PR events that happen and then to go out on the road and direct a show. This is the first full-time job in my whole life. Took me a long time to get there! Did you immediately want to do it? It’s an amazing opportunity. There are so many crews that were here when I was a Rockette. But I haven’t worked here ever in this capacity. I did assist on an Easter show here and swing the show, but that was it and then I was pregnant, so the last year of the Easter show I didn’t do it, and I’ve always been really happy on the road. It’s a great training ground for Rockettes, because there are 18 in the line, so you have more time to really get into a lot of specifics in terms of cleaning and training them. You don’t have the two casts. There are 20 people, with the swings, as opposed to 80. It’s smaller. I’m a hands-on kind of person. I like to get in there, and I like to do it with them. Can you tell me about the changes in the show this year? We’re starting with a new overture, and it features the orchestra pit rising. The singers are on the choral staircases, and the two organs are used. It’s a great way to get the audience settled, to say, “We are taking you on a ride. Buckle up, here we go.” That leads into “Reindeer.” [Ed. note: The Rockettes are dressed as reindeers, but the number is called “Sleigh Ride.”] The transition is a little different: They’re coming from the basement up on the elevators, so you see their antlers in silhouette as they rise. It’s pretty. So there are little changes here and there. The big thing is that the story within our 90-minute show is about two brothers who are in search of a Christmas present for their little sister; there’s a snarky 14-year-old that doesn’t believe in Santa and is just babysitting a little kid, and the younger one, Ben, totally believes. They find the real Santa, and he knows he’s the real Santa. They go to the North Pole, and they’re in search of this perfect present and Santa has all the helpers build this ginormous wall of packages and presents. They climb it and open different things—a bike comes out, one of those creepy monkeys that claps, a spaceship—and all the while we have rag dolls sneaking out through the set in their tap shoes. The wall is about five stories high. There’s a big giant soccer ball, there’s a rubber duck that opens, but all the while I have 12 Rockettes onstage sneaking around while the boys are looking up and not noticing what’s going on. The last thing is a rocking horse, and you hear the William Tell Overture, and you hear [Taps out the rhythm with her hands]. It’s the Rockettes on their blocks rising from the pit. The boys are like, “Wow.” And we get into our rag-doll number from there. We have new costumes. They’re a little more form-fitting, like an empire, so they’re tighter, but they have a full cancan skirt underneath with asymmetrical-striped legs. Really cute bloomers underneath; instead of a kick line—it’s still a cancan—we put three blocks together and there’s one Rockette that will lay down, one that climbs over and one that’s behind dancing, so it looks like the one lying down is doing the legs. So the video-game dance—“Humbugged: Rockettes to the Rescue”—has been taken out. Yes. We have so many people that come back and see the show year after year. We try to have something new to offer. Except that “Rag Dolls” isn’t a new work. I appreciated the fact that the video-game dance showed the Rockettes as athletic and powerful women; now the dancers are “dolls” again. How do you feel about that? I can see both sides. I think that in the video game it was very empowering for girls and women. It was so clever and smart, but I also think that “Rag Dolls” is such a fun, happy number that you can’t help but watch those rag dolls bopping their heads—they’re still dancing hard, it’s just that they’re in their tap shoes this time, and they have a great entrance. It’s a fun number, and we had 18 streamer cans set at the pit, which makes a wall of streamers at the end of it. There are toys on the video wall that pop out. It’s an all-inclusive package. What does a Rockette represent to you? Back when I was a Rockette, it was maybe considered more of a showgirl kind of thing than it is now. The athleticism—these women can do any style that you ask them to do. It’s really crazy. We did a thing for America’s Got Talent and I was given the music of Pitbull. I would never think of putting Rockettes and Pitbull together, and we had the best time doing that number. It was different for us. We actually had our own hair in ponytails—something we’ve never done. I’m amazed at their confidence, their grace, how well they keep themselves in shape. It’s amazing what kind of dedication they have. And if they’re not showgirls, what are they? They’re dancers, they’re athletes, they’re artists. Are the other numbers the same? They are, basically. I think we’ve refined things. “Snow” was brand-new last year, and it’s had a year to settle. I always feel this with a number: It only gets better. It’s just an amazing, gorgeous piece of work. It’s really beautiful. I think the women have found more confidence in the number; the elevators on are three tiers, and I think they’ve gotten more used to that. When you go from 12 inches down, that’s a big step. What do you love about that piece? It’s a ballet-based dance. They make beautiful lines. It starts with one Rockette doing chaînés. They start with arabesques and we have some of the most beautiful arabesques I’ve seen: beautiful legs, beautifully costumed and it’s not a, “We’re in the Money” kind of number. [She waves her hands from side to side.] It’s just an ethereal, graceful, elegant number. There are a lot of arms too. Yes, and arms in a space this big reads so well—if they’re clean. I’ve really tried to work on not being rigid, but still being sharp, because we still have to dance to the music. There’s a fine line between making it robotic and still being dancers and artists. 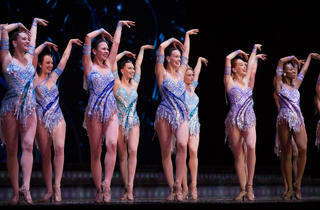 What would you have liked to perform as a Rockette that’s in the show now? I would have loved to have done “Snow.” I would have been thrilled to do any of the choreography that’s in the show. It’s just been fine-tuned since it had gotten more challenging and harder, and I didn’t always get to use that ballet technique that I had at the time. I would have loved that. Where do you think the Rockettes should go from here? I think they should continue on this path and keep getting better and stronger. I hope that there are more avenues that open up to work with new artists in music and in all of those things. It would be great for us to expand ourselves as much as we can. But do you have creative aspirations? Do you have plans to choreograph? I would love to. This year, we were just working to get everything settled and get the Christmas up and running. We’ll see what next year brings. It’s so interesting: When you go to do a number, you think you have this huge stage, which is huge, but then when you put 36 women on it, it’s really a challenge to still be able to dance, make lines and get in one line. You wouldn’t think it would be, but I spend a lot of time with my graph paper. I’m old-fashioned and I do everything on graph paper with pencils. I know there are programs that do these things, but I count my squares because every step is, like, two feet. I know how far you travel. It’s a lot of math. Do you have ideas for new numbers? I haven’t been asked yet. If they tell me something specifically, I would love to be able to explore that. Why have you been so loyal to this organization? Has it been a matter of circumstance or something else? I think I just really love it. You know when you find your niche and you just think, Okay, this has been a really great thing. Listen, this is my 27th Christmas. And I haven’t missed one, and I feel just as excited—it doesn’t matter where I am doing it. I learn new things every time. There are new things to explore, whether it’s new cast members, new numbers, new technical things we’re doing—I am invigorated by the whole process. The man who plays Santa started the year before me. I think there’s just a real family here, and I’ve felt really happy here always. I’m very fortunate. I was happy when I was a dancer and I feel way fortunate that I was able to continue on. What else are you working on with the dancers to improve? We talk a lot about heart, and that it’s not just slapping a smile on our face and just doing the steps. To me dancing is more than just doing the steps; you have to find a way for your joy to come through. I think it makes a better time for the audience. And believable. I don’t want a fake smile. Now, does that happen 100 percent of the time? No. It can’t. I don’t think anybody could do that, but that’s what I strive for and I feel like anyone who comes to the show, it’s maybe the only fun thing they’re going to do this Christmas, and I don’t care if it’s a 9am show or a 10pm show, I expect everybody to give 100 percent. We owe it to people. And it is their J-O-B on top of it. I just like people to put their best effort in every time, and I always think the more you practice that way, those days when you don’t really feel it, it still comes out because you’ve trained yourself to do it that way. When people get along better, they dance better and Rockette work is such a team effort that everybody has to get on board. I just remind people of that. It was certainly the case when I was a Rockette. We had a lot of laughs, and we did all the shows back then. There weren’t two companies. We had sleeping bags and we slept in our dressing rooms in between shows. We’d have an hour off. Five shows a day—I never did six. I was out on the road by then. It’s a lot. I don’t think the show was as demanding. Not that the show was easy back then, because it wasn’t. It’s just a different kind of show. We did a “12 Days of Christmas,” but it wasn’t a tap number. We wore fat suits, and it involved the entire ensemble and all the Rockettes. It didn’t take stamina; it was basically walking. So it was a different beast. Technically, what are you working on? I’m a big believer in ballet, and I always tell everybody: I recommend taking a ballet class, because that will always help you stay strong and centered. Do we lift weights, yes, do we get on ellipticals, yes. There are other things to do, but ballet is the base for everything. Linda Haberman, the previous director who left the organization after her dynamic spring show Heart and Lights was canceled at the last minute, wasn’t a Rockette, but you were. Do you think you need to have been a Rockette to direct the company? I don’t think you have to be a Rockette at all. Sometimes, though, when I see them struggling, I understand why. It’s hard to dance right next to somebody. You really have to know where the path of your arm is going, and if you’re doing just kicks, it’s very easy to bounce back and forth. You really have to be on your center. It’s like doing fouettés center stage: You have to stay on that dime. It’s the same thing with kicking or else you get this wave. I feel like I relate. What was the turnover like when Linda left or was forced to leave—I don’t know what happened. I don’t know either. I wasn’t involved in any of that. I think everybody went through a period—it was a change, and change isn’t always easy and I think we all just banded together and wanted to continue doing good work. No, no. We do have new Rockettes, but there are people on maternity leave or doing a Broadway show. There is always some fluctuation, but I would say we have mainly everyone back. The spring show is being produced with a new creative team. Do you have anything to do with it? I don’t. I met Warren [Carlyle, director and choreographer]. We’ve talked a lot. I am not involved at the moment on it. Will it be totally new? I don’t know. I have seen a few bits and pieces from a workshop that he did, but I don’t know what’s in or not in. Time will tell. He’s lovely. He’s a real tapper. He’s a really friendly guy. So far, that’s all I know. Radio City Christmas Spectacular is at Radio City Music Hall through Dec 31.